I officially have enough brushes to get me through any amount of eyeshadow I choose to use in a week. So, now that I also picked this set up from Too Faced, maybe I'll stop buying more. Maybe. 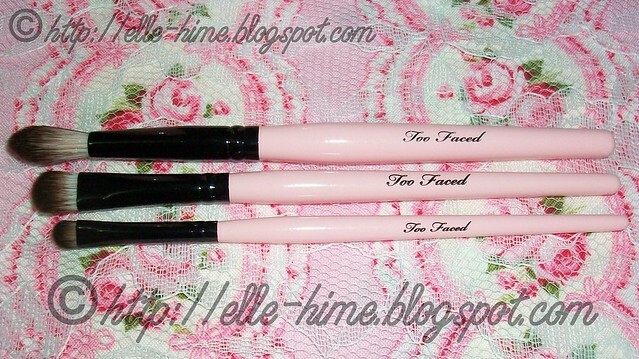 I'm a sucker for Too Faced's brushes since they are pretty, and made of super-soft synthetic hair. I look for vegan brushes because I can be sure no animals were hurt in making them, and synthetic fibers are more hygienic. So, as promised back in my haul post, let's take a look at this set! First off, packaging. These arrive in their tube, which is only shrink-wrapped in plastic to protect it. For me, this is wonderful. I love minimal yet functional packaging because it's less wasteful and I don't guilt-trip myself for adding more to landfills. 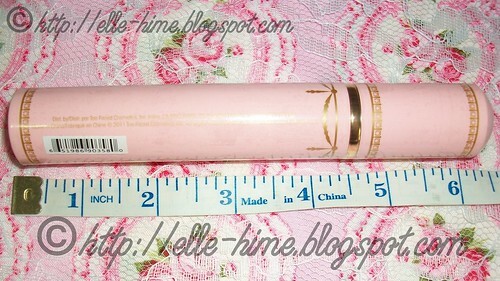 I could not find any sizes mentioned, so here is how big the tube (still wrapped in these photos) is. I was pleasantly surprised to find that this was no wimpy cardboard tube, as well. When I took it out of the box TF shipped in, I thought "oh, it must be plastic! But instead the whole thing is a tin container! I'm guessing it might be aluminum? It's very lightweight, but entirely made of metal. Overall it feels quite sturdy. The cap stays on very firmly. As for the brushes themselves, they come in a plastic sleeve to protect them within their tube. I will probably keep these sleeves for awhile until I get over being paranoid about my precious brushes. Also, can you see that the crease/blender brush has an additional plastic tube protecting it's bristles? This is great packaging, but once I slipped it off the brush fluffed out and now it can't ever be put back on. The brushes are quite dainty, with skinny handles, and they are all about 5½ - 6 inches long. I was really curious about their sizes when I first saw this set, but could not find that info anywhere! I'd say that these have no unneeded bulk, but they perfectly easy to handle. 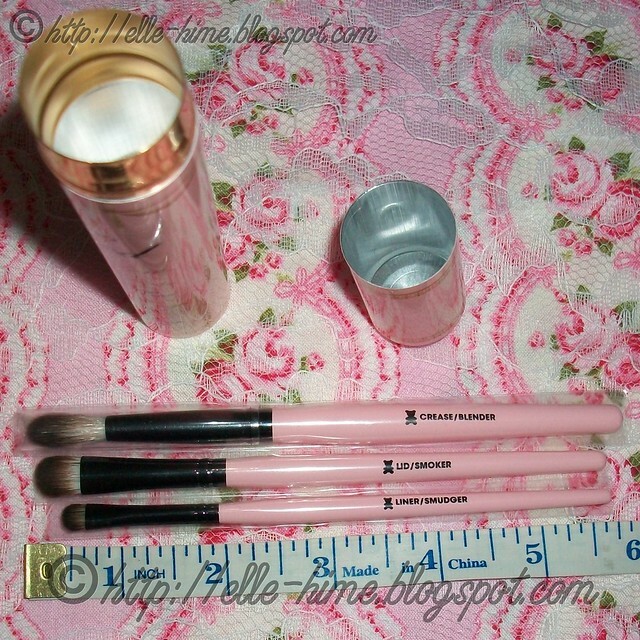 The colors, black and light pink, are very pretty and do set the brushes apart from anything else I own. The "Teddy Bear Hair" that TF uses is the regular natural white-tipped-with-brown that also looks very nice. But are they usable? The closest thing that I owned to the Lid and Liner brushes was a Bare Escentuals brush that I hate trying to use. That brush is like trying to apply your make-up with a tongue depressor. So, when I saw that these have to same type of flat shape I was a bit apprehensive. I have tried them and can say that they are sooo much better, though. Yes, the fibers are soft, but these have enough stiffness to pick up product and not go everywhere. Your make-up will land where you want it to. For people that turned their noses up at the 6-piece set for being "too soft", I'd say this set might be worth a try instead. Personally the Liner/Smudger is best suited to the smudging and applying pigment to targeted lid areas. I prefer a skinny or angled brush for lining. And as for the Crease/Blender Brush, it's soft, fluffy yet not too fluffy. Serves it's purpose perfectly, though it may not be the most unique brush. My final verdict is that these brushes end up costing about $13 a pop. There are most certainly cheaper alternatives, but looking at similarly priced competing brands, these are a fine choice. They're very pretty, easy to handle, and they come in a neat little case that will keep them safe in a bag or drawer. Also, did I mention that they are vegan? 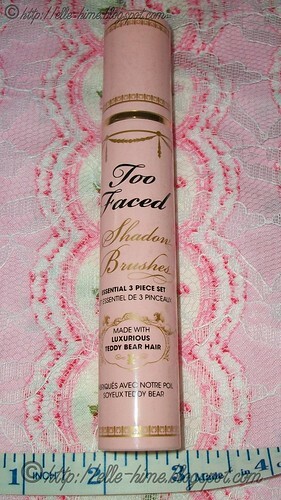 Too Faced is known for creating high-quality synthetic brushes. And because they are synthetic, you can use them for applying creams and liquids as well as powders. They don't shed, they clean up nicely, and they do their job! I would reccommend these to... someone looking for vegan/synthetic brushes... anyone who needs soft brushes... someone who doesn't have something similar in their collection already... a fan of pink items... give as a gift. So, does anyone else want or own these? If you did buy them, what do you think of them? How do you use them? Or, if you didn't get them... what do you think is better? Disclosure: I purchased the product in this review myself and have shared my honest opinion. Eyeshadow brushes and they are pink!! 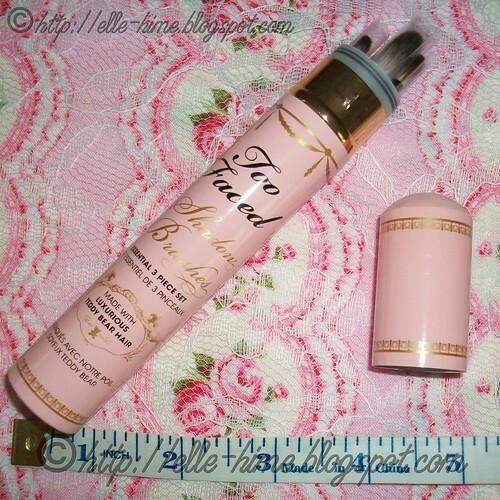 too bad Too Faced is not available in India :/ but They are on my list my next trip to US! gorgeous !